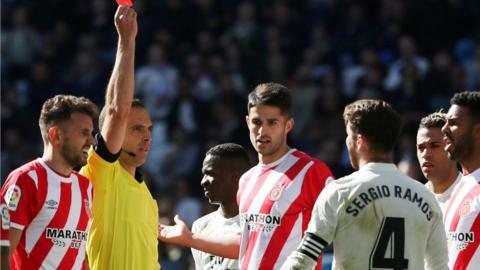 Real Madrid miss the chance to go second in La Liga as Girona come from behind to record a surprise away win at the Bernabeu. Karim Benzema scores twice to move up to sixth in Real Madrid's all-time top goalscorers as his side beat Girona in the Copa del Rey. Lionel Messi score his 26th goal of the season as Barcelona re-establish their five point lead at the top of La Liga with victory over 10-man Girona. Barcelona end plans to play Girona in a La Liga fixture in Miami due to a "lack of consensus" between stakeholders. Manchester City winger Patrick Roberts, who is on loan at La Liga club Girona, says players "can't discredit playing abroad".